Strictly Series 16 – Dressed for Success! I can’t begin to tell you how thrilled I was when the BBC invited me back to compete in another series – my sixteenth! Sweet sixteen! Well, let me tell you, nothing would be sweeter than the heady reward of lifting aloft that ever-elusive glitterball at the Grand Final. Could this year be my year I wonder? There’s only one way to find out, my loves — Strictly‘s back… and I’m ready to dance! Now there’s a spectacular teaser trailer if ever I saw one! ￼BBCStrictly￼ tweeted it with the comment “Wait till the end…” and with good reason – fast forward to 1m 13s and you’ll see what they mean. Simply joyous! I’m taking it as a very good omen! The competition this year is certainly hot, with a very strong line-up as I’m sure you could tell from the red carpet launch show two weeks back. What a spectacular event that was – the BBC working its phenomenal televisual magic once again. Every year it just gets better and better, and series 16 is set to beat all others with the calibre of talent – and its wonderful production wizardry. Wizardry was certainly the word when I made an entrance atop a giant glitterball at the end of the group number! It’s very important to make a memorable entrance, you know! Our family of Professional dancers has had a bit of a reshuffle – this will be the first series without Brendan Cole who’ll be sorely missed by all, as will the lovely Chloë Hewitt, too. The three newcomers to the Strictly fold are Johannes Radebe, Luba Mushtuk, Graziano Di Prima – three very talented dancers who are sure to win your hearts as you see them in action. Let’s extend a very warm welcome to them all! We’ve fifteen celebs from a fantastic diversity of fields this year – presenters, actors, singers, sportspeople, journalists, a comedian and even a doctor! …Those all important pairings are as follows, and I rather think they make for an exciting, if not sizzling series indeed! …and of course, my new partner for Strictly 2018… the rather fabulous Susannah Constantine – fashion journalist, presenter, author… and now dancer-in-the-making! We’ve got off to a tremendous start in rehearsals: we happen to be very well suited personality-wise, and as you know, we’re both very particular about being properly, and appropriately dressed. I’m hoping her attention to detail will translate to the dance floor, but if initial enthusiasm and determination are any measure, I say we’re dressed for success! Our first dance in the competition is the Samba. And however you choose to pronounce it, it’s a tall order for anyone’s first performance on Strictly! In at the deep end as regards energy and performance level, not to mention the steps… and it’s a physically demanding dance too. All that said, what better way to immerse yourself into the spirit of the show – it could work a treat for gaining experience and building confidence, and, thinking positively, our dance could be a triumph – as evidenced by the rehearsal clips below! Not long to go now until the theme tune begins, the audience clapping in rhythm, Tess and Claud heralding the start of the competition… and fifteen fledgling couples waiting their turn to take flight and perform live for the judges, the studio audience, and the nation! 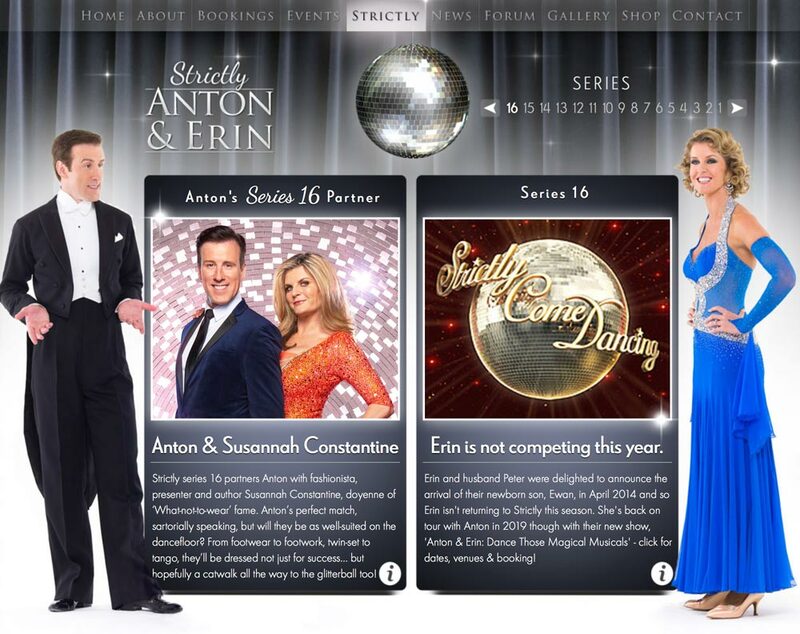 Our dance card’s all set up ready for this series over at antonanderin.com/strictly – and there you can look back over the past 15 series’ dances – Erin’s too – some fabulous performances to revisit. 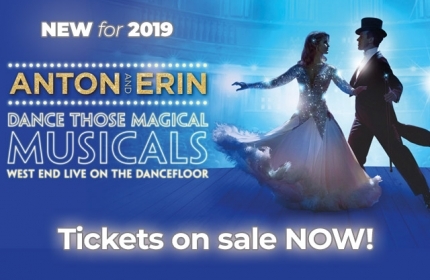 If you want to see more, don’t forget Erin and I are on tour in 2019 with Dance Those Magical Musicals! Running from 25th January to 24th March, it’s going to be our best tour yet! 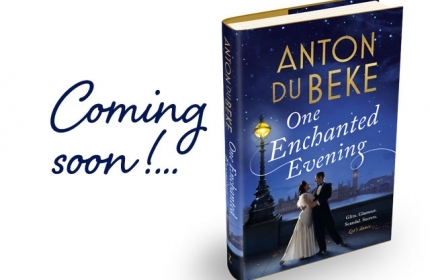 And I should also mention that my debut novel “One Enchanted Evening” is due for release on the 4th October – less than 2 weeks away! You can pre-order a signed copy from WHSMith here, or click through to read more about it. But until then, Susannah and I have some dancing to do! Wish us all the very best of luck, my loves, and we’ll see you on the dance floor this evening… tune in, BBC1 6.15pm – let’s dance! Well my loves, the buzz is certainly building around my upcoming debut novel and I’m delighted to announce that I’ll be embarking on a special tour to coincide with its launch… a Book Signing Tour! 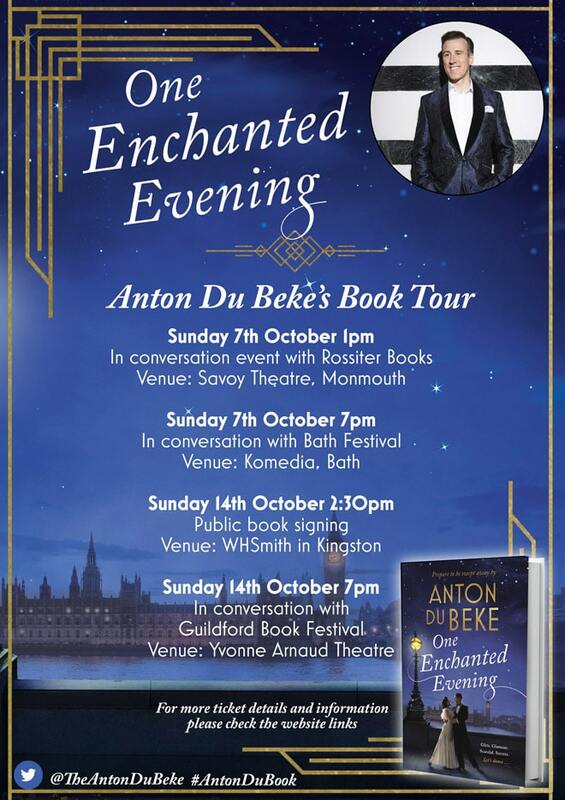 I’ll be appearing at a number of literary events and booksellers this coming October where I’ll be talking about, and signing copies of, my debut novel: One Enchanted Evening. Do come along – I’m so excited to share with you the insights and inspirations behind all the goings on at the Buckingham Hotel! Bath – Komedia, Sunday 7th October at 7pm – ‘In Conversation’ with Bath Festival. Kingston – WHSmith, Sunday 14th October at 2:30pm – public book signing. Guildford – Yvonne Arnaud Theatre, Sunday 14th October at 7pm – ‘In Conversation’ with Guildford Book Festival. Have a look at my previous post for more details about my debut novel, and links to purchase in other formats and from other resellers. I do hope to see you in October! 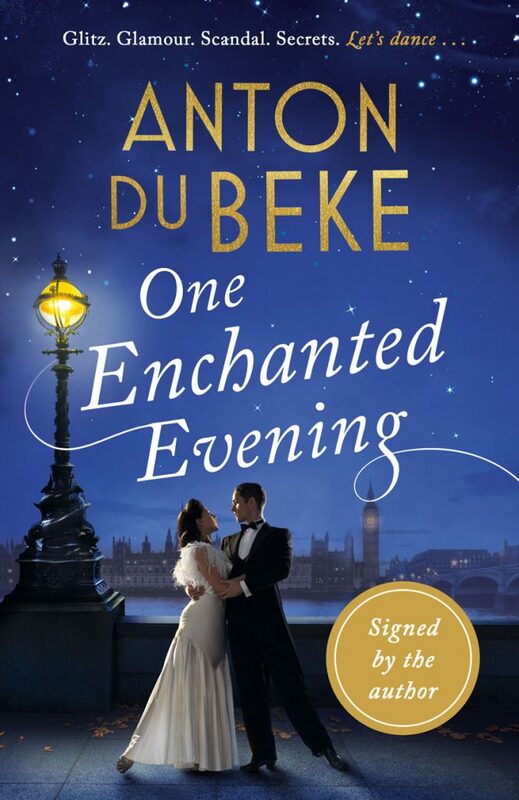 Signed copies of One Enchanted Evening now available to order! I’ve some very exciting news for you today! My debut novel, ‘One Enchanted Evening’ is to be released on the 4th October, and as a special treat, there are special edition copies personally signed by yours truly available to buy now! Pre-order now, available 4th October! 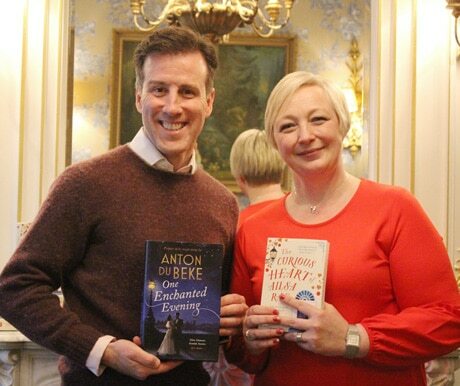 Don’t forget to follow me on twitter @TheAntonDuBeke #AntonDuBook… and Facebook… for all the latest news about my novel (and Strictly, too, of course! )… and sign up to my mailing list to receive my updates direct to your in-box! 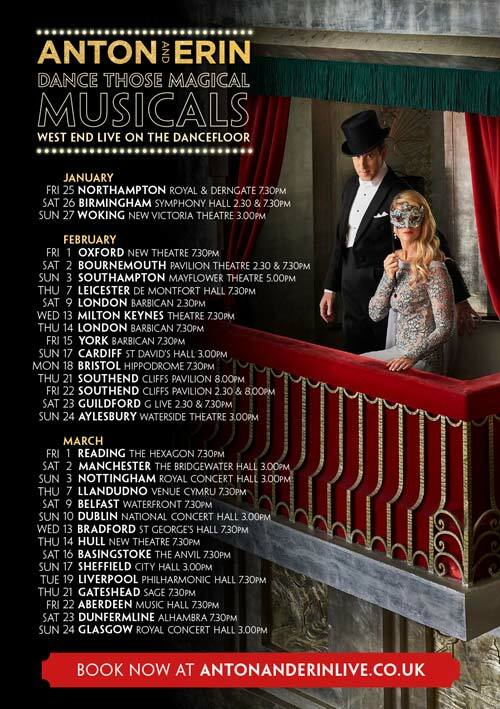 ‘Dance Those Magical Musicals’ – our 2019 Tour! 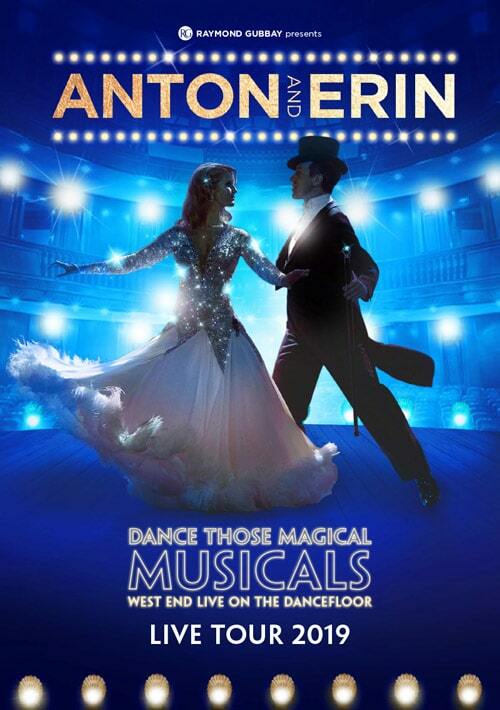 I’m tremendously excited to announce that tickets go on sale this morning at 10am for our 2019 Tour: ‘Anton and Erin… Dance Those Magical Musicals’! We’ll be bringing the West End to the dancefloor, and Erin and I simply can’t wait! 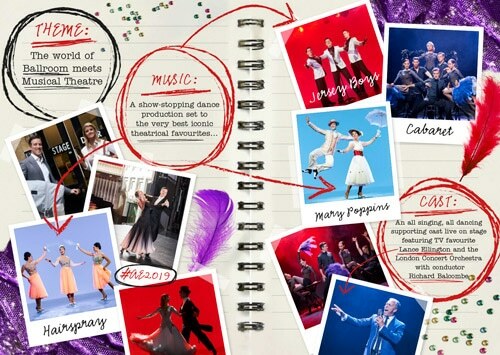 You can expect fabulous dancing, music and song as well as wonderful costumes too. Erin and I are particularly excited about this tour as it brings together a collection of the most iconic numbers from some of our most favourite musicals – it really is going to be a very special production indeed. Featuring ‘Phantom of the Opera’, ‘Mary Poppins’, ‘42nd Street’, ‘Wicked’, ‘Top Hat’, ‘Hairspray’, ‘Jersey Boys’ and even more… just thrilling! Joining us will be the London Concert Orchestra with conductor Richard Balcombe, a sensational West End dance ensemble and the brilliant star vocalist, mellifluous Lance Ellington. We’ll of course include the very popular ‘Q & A’ section where we answer your questions live on stage. For more information visit www.AntonAndErinLive.co.uk – plus, there are social media accounts for the Tour too, so make sure you follow them for all the news and backstage photos as rehearsals get underway and the Tour begins! Follow our Tour on Twitter and Facebook. Erin and I are very excited to see you in the audience, we do hope you’ll come along and join us as we Dance Those Magical Musicals! I’m thrilled to finally share this video with you all today! 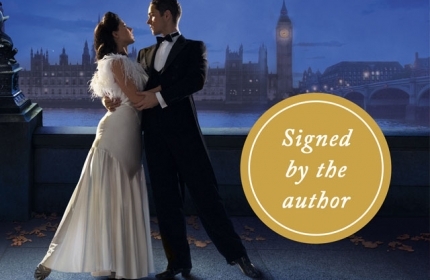 I teamed up with fellow author, the lovely Stephanie Butland, to give her a tango lesson. In her gorgeous and heart-warming book, The Curious Heart of Ailsa Rae, Ailsa, following a heart transplant, embarks on a journey to do all the things she’s ever wanted to. One of which was to learn to tango. Whilst researching the book, Stephanie took tango lessons to learn about this beautiful craft and I was delighted to be able to give her a lesson and have a twirl! This tremendous novel will appeal to anyone who believes in second chances (and loves dancing) and is available to buy now! Talking of dancing (as I often do), my debut novel – One Enchanted Evening – centres around the spectacular ballroom of the exclusive Buckingham Hotel in London’s Mayfair where the rich and powerful, politicians, film stars, even royalty, rub shoulders with Raymond de Guise and his troupe of talented dancers from all around the world. They must enchant them, captivate them, and sweep away their cares. Accustomed to charming and waltzing with the highest of society, Raymond knows a secret from his past could threaten all that he holds dear. But the storm clouds of war are gathering, and beneath the glitz and glamour of the ballroom lurks an irresistible world of scandal and secrets. 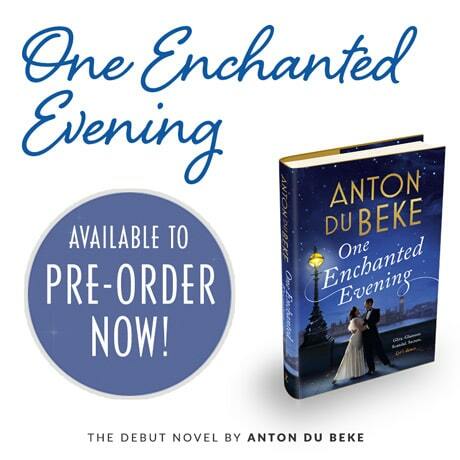 You can pre-order your copy of ‘One Enchanted Evening’ today, from here on my blog in lovely hardback and digital versions too. I do so hope you’ve enjoyed this video of Stephanie and me, and I hope you’re inspired to take up dancing for yourself! Meanwhile, make sure you’re signed up to my Mailing List, then you can receive all my updates direct to your inbox! Pre-order now – available 4th October! 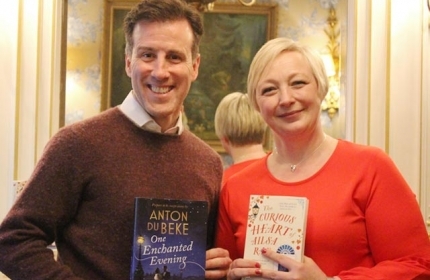 Anton Du Beke – the King of Ballroom, Strictly Come Dancing royalty, and household name – is truly making his mark as one of this generation’s all-round entertainers. 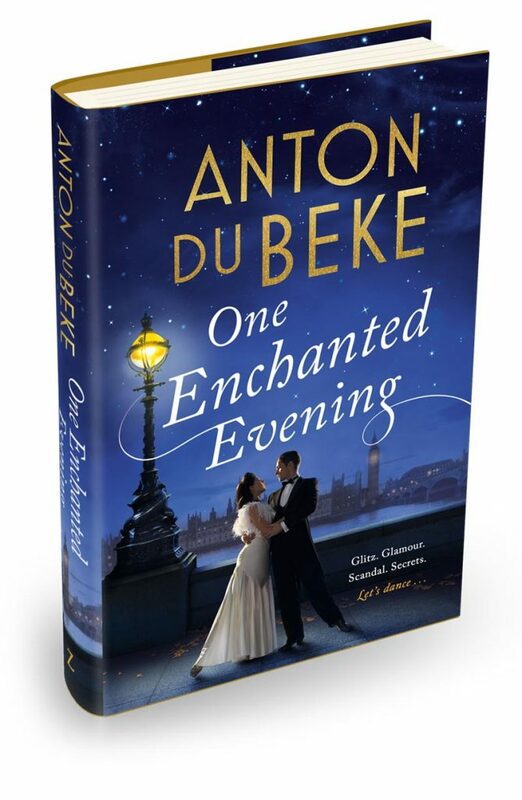 Hot on the heels of his debut album From The Top, Anton now realises his boyhood ambition and will be publishing his first novel, One Enchanted Evening, later this year. The consummate storyteller, adept at captivating audiences will now captivate readers as he whisks them away to worlds of dance, intrigue, high society and scandal… bringing the golden age of dance to life, page by page. 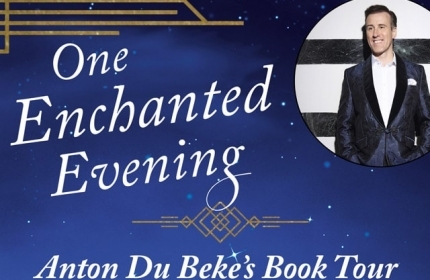 As Strictly‘s longest running professional dancer, achieving a remarkable decade in dance on tour with his professional partner Erin Boag, and as a much sought-after personality and presenter, Anton is the perfect author to lead the reader to the dancefloor as never before. 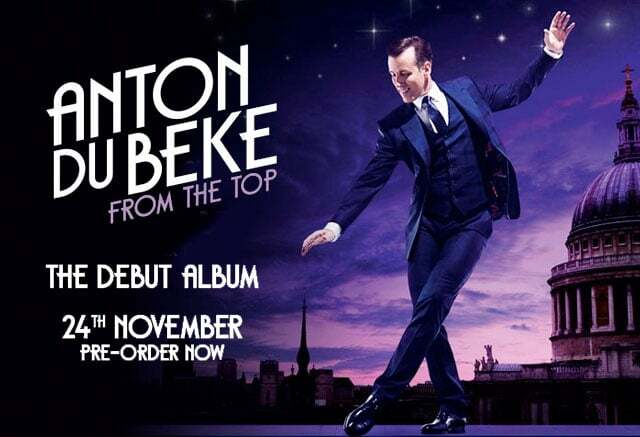 Make a date with Anton Du Beke this Autumn and prepare to be swept off your feet! 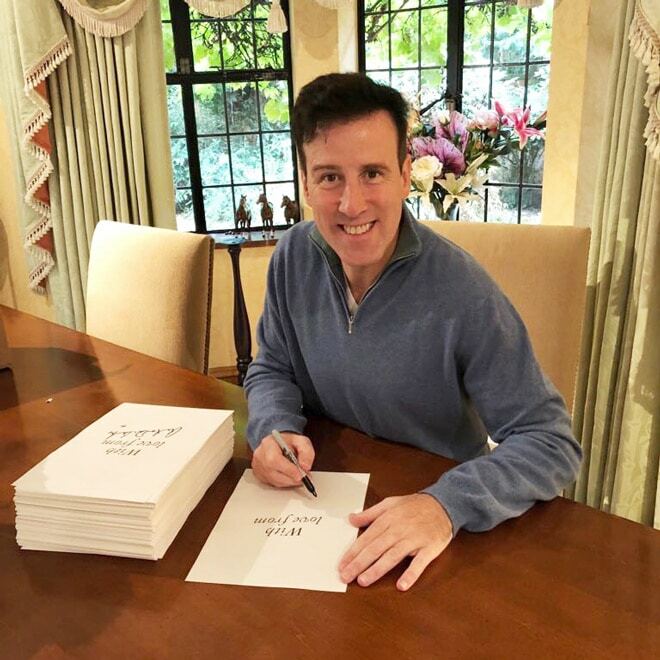 Meanwhile, follow Anton on twitter: @TheAntonDuBeke #AntonDuBook… and pre-order your copy now from the retailers’ links above! Well my loves, the glorious heights and twinkling lights of Blackpool Tower may well have been in our sights, but alas, t’was not to be! 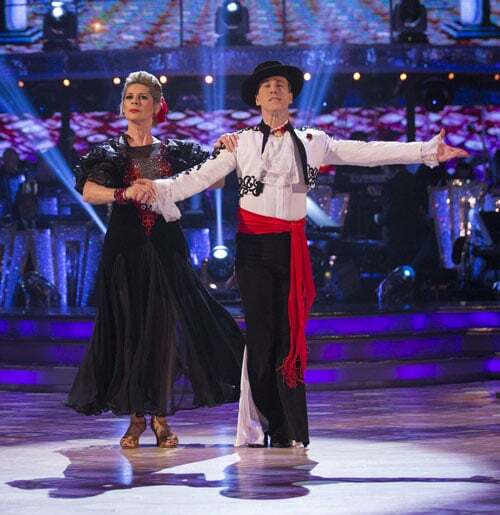 Our Week 8 Foxtrot was unfortunately to be our swan song in this season of Strictly Come Dancing, but for my part, dancing with the wonderful Ruth Langsford has been thoroughly uplifting, and we absolutely ended our time on a high! Ruth and I were both thrilled to be able to dance a Foxtrot to the wonderful Bobby Darin version of ‘Mack The Knife’. A classic tune, and one with particularly strong emotions for Ruth – it being a favourite of her Dad’s – so this dance became something of a tribute to him, and all the more special. …with some moves which made the cut… and some which didn’t! When it came time for costumes, we knew this was going to be a corker – a proper suit for me, and hats and canes for us both. Classy, and just the ticket!… Though, as it turned out, not the right ticket for the Blackpool Express! I for one thoroughly enjoyed our performance – how could I not? With a wonderful partner, wonderful music, wonderful staging… I was in my element! And although the showtime nerves crept in a little for Ruth, I know she enjoyed every second of it too. From our side-by-side intro section, with jazz hats and cane action… through to the our time in hold as we glided across the dancefloor… Joyous! Admittedly the tempo was somewhat animated and our Foxtrot had elements of mild gallop at times but we found that keeping things moving along was a good way of managing the timing – Ruth will admit that counting wasn’t her strong point! But catching props on live TV certainly was – who knew?! What a star; is there no end to her talents?! Something of a result was that I managed to remain upright at the end of the number – I was determined not to repeat my indecorousness of last week! But I think as we approached the Judges for their critiques, we both felt we may not have quite captured the magic of our bewitching Quickstep, our tumultuous Tango, or indeed the roof-raising finalé of our Paso (indecorousness aside!). Had this week’s dance out-foxed us? It came as no surprise that Craig didn’t enjoy the opening sequence, said the routine was like a horse trotting and pointed out a number of errors. Darcey like the amount of content though said there was no glide, and that Ruth was ‘swimming’ in hold and “out of her depth” in this dance – to which I disagreed, of course. Shirley was firm (with Blackpool on the horizon) and was put off by the quicks versus slows; she said it wasn’t her favourite. Bruno said “It was the fox that lost the trot… it turned into a gallop,” and that the timing was out… Oh dear, it didn’t go too well in their eyes… though given the Foxtrot is no easy dance, I still hold that Ruth performed amazingly well. 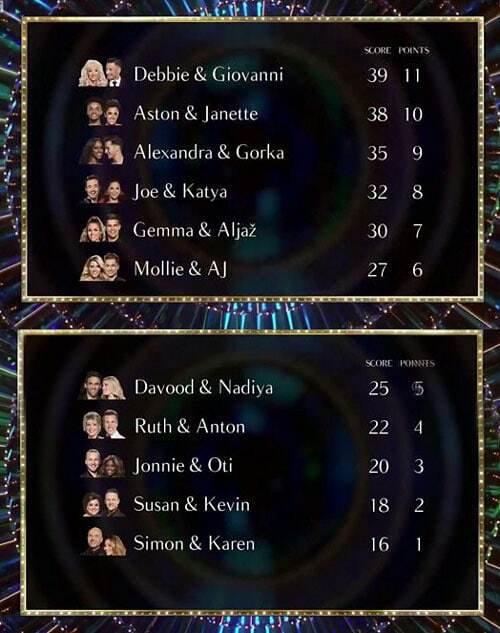 The scores confirmed our worst fears… Fours from Craig and Shirley, and fives from Darcey and Bruno for a total of just 18. “Undermarked,” I hear you cry! We certainly got that sinking feeling, especially when, by the end of the show, we were once again at the bottom of the Leaderboard. The Sunday night results show was an event in itself. I simply must mention the beautifully poignant and powerful Remembrance Day tribute dance that us professional dancers had the honour of performing. I’m not sure if there was a dry eye in the house by the end. So very fitting for such an important day when we think back to those who gave their lives for our freedoms. We were thrilled to be accompanied by the RAF Spitfires Choir, and to have so many servicemen and women join us in the audience. Huge and heartfelt thanks to all of them. But the evening remained unforgettable for yet more reasons… As one by one the couples were saved, for the first time this series Ruthie and I were bathed in the dreaded red light… we were in the Dance-Off. Testament to how tricky the Foxtrot can be, we were pitched head-to-head against Jonnie & Oti who’d also fallen foul of this dance. Suddenly the distant glow of the Blackpool Illuminations was becoming dimmer and dimmer with every passing moment. We danced our dance as if it were our last, and once again, I was so proud of Ruth for giving us such a fabulous performance… and, let’s not forget, catching the hat and cane again at the end! What a pro! 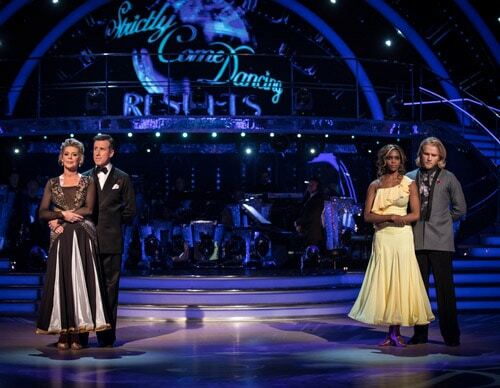 Credit where credit’s due, Jonnie & Oti delivered a wonderful dance, and the Judges were unanimous in saving them. Understandably, Ruthie and I couldn’t hide our disappointment – we were of course utterly heart sunk not to be heading to Blackpool, but at the same time thrilled and so very thankful to have made it this far in the competition and to have had eight wonderful weeks performing together on the Strictly dancefloor. Even after Strictly, they couldn’t keep us apart, such was our partnership! 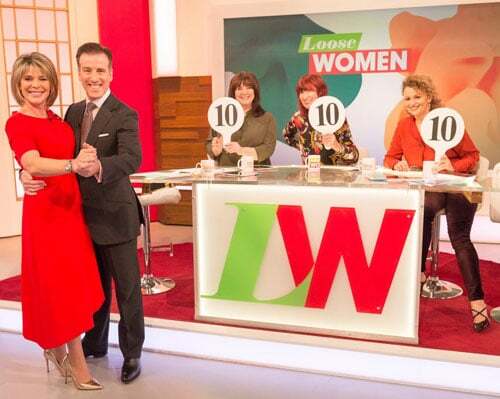 Here we are on Loose Women… watch and enjoy – we even have one last twirl at the end! Well my loves, there ends my Strictly journey for this year – eight wonderful weeks with a truly tremendous partner – what an experience. This series has been simply joyous and I couldn’t have wished for a more entertaining, more enthusiastic, more sympatico partner. We’ve laughed, we’ve cried, we’ve had thrills… and spills, we’ve danced and danced and danced some more… but most importantly, we’ve had just the most fun! Hats off Ruthie, you’re a star! 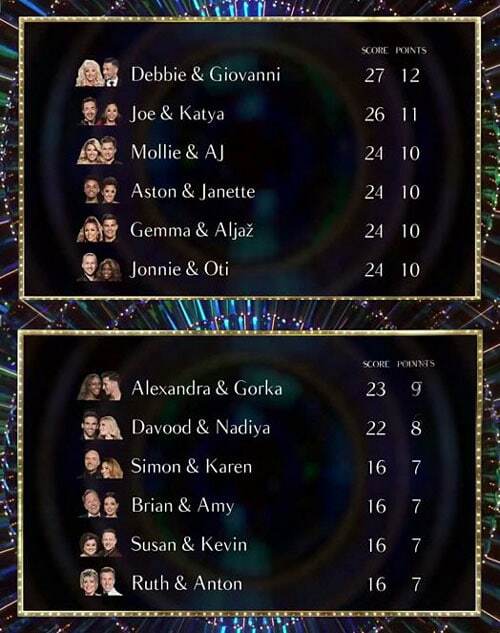 Ruth and I would also like to convey our heartfelt thanks to you for all your love, your unending support, and for being so generous with your votes each week – you’ve been instrumental in enabling us to keep dancing all this time, and we are so very, very grateful. You’ve helped make Ruth’s Strictly dream a reality, and we so hope we’ve entertained in return. The competition is certainly hotting up – ever more so for us this week with a hot-blooded Paso Doble to ‘The Shady Dame From Seville’ – a very entertaining number from the Julie Andrews classic movie ‘Victor/Victoria’. Whilst parody formed a good part of our performance, content must always be king and we knew we had to deliver a delicate balance between the two… a balance maintained through to the very end… almost! I was certainly a vision to my sizzling señorita up on her balcony fanning herself in the heady Spanish evening air… She spied me down below and her heart was all a flutter. I took my lead and went up the ladder, rose in teeth, whilst she came down the stairs, missing each other with comic timing. Ruth continued to fan herself whilst I came down to join her, at which point we had a scene-setting side-by-side moment before we cast away our props, took each other into hold, and we were off! With a flurry of footwork, this next section was filled with many of the dance’s core steps, made all the more difficult against the changing tempo of the music. I must stress here that it was a real accomplishment for Ruth to be able to pull that off – we’d worked so hard to get it right and whilst our theme required a peppering of humour, there was to be no doubt in the Judges’ minds that this was a real Paso! Then came a wonderful sequence with our parallel stalking kicks – again superbly done by Ruth, with Hayley’s soaring solo vocals scaling the heights to a top G Julie Andrews would have been proud of. We were off again, this time spinning and traversing the floor at breakneck speed and with such gusto as the music rose to its finale… Our momentum matched the crescendo, and we’d built up so much that by the time we arrived at our final positions I was literally bowled over! Carried away, you might say – I just went! …And unfortunately I took Ruth with me! The audience erupted, Eamonn’s face was priceless as he looked on, and even the judges couldn’t contain themselves (well, all bar Craig, who continued to take notes). Such was the disarray, Tess had to hurry us across to the Judges so we could keep the show on schedule! Bruno was quick to tell me that I looked like Manuel from Fawlty Towers on Spanish night… “Murder on the dancefloor,” he said, “What more do you want? !” We weren’t quite sure if any of that was good or bad! Craig made it quite clear; “This number is essentially a drag act, which is what we got tonight. It’s entertainment vs technique. At least the people at home will vote for it, but I can’t possibly.” Ouch. Thank you very much! Of course, I’d have preferred it if the judges were unanimous in their appreciation of our artistry, but we’ve long-since learned you can’t always please everyone! The scores sang an all-too familiar tune: a four from Craig, and sixes from Darcey, Bruno & Shirley for a total of 22. The same as last week; we’re nothing if not consistent! By the end of the night we ended the show once again at the bottom of the leaderboard. But now with only ten couples remaining it was getting especially tight, not least having the wonderful Aston & Janette placed immediately, and precariously, above us. The results show came as a surprise for everybody. No wonder it was November the 5th – there were certainly fireworks at Elstree. Ruth and I were simply overjoyed to make it through – once again, thanks to all of your votes, every single one of them – your support is just tremendous and means the world. What none of us were expecting, however, was that the Dance Off would be between Mollie & AJ and Aston & Janette. Nothing’s ever a foregone conclusion with Strictly. 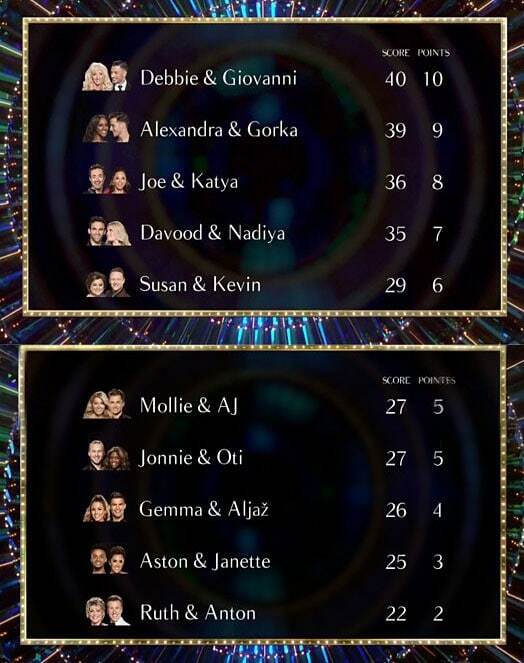 After both couples danced their wonderful dances once again, Darcey and Bruno both voted to save Aston & Janette, but Craig and Shirley with her deciding vote saved Mollie & AJ based on seeing greater technique and accuracy. A shock result indeed – we were all knocked for six. 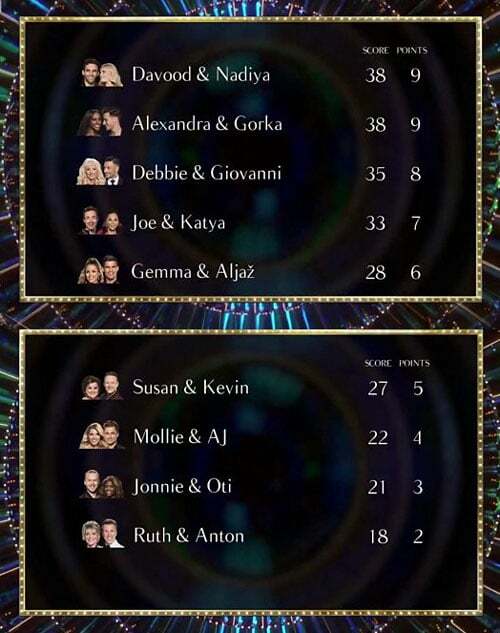 None of us wanted either of them to be in the dance off, let alone to leave the competition, but with placements so close on the leaderboard, it’s never been clearer how important the public vote can be. And so, we bade a very sad farewell to Aston. I’m sure you’ll all agree that he simply must continue dancing – that boy’s got real talent! This week Ruth and I have stepped it up even more. There can be no mishaps Saturday night. 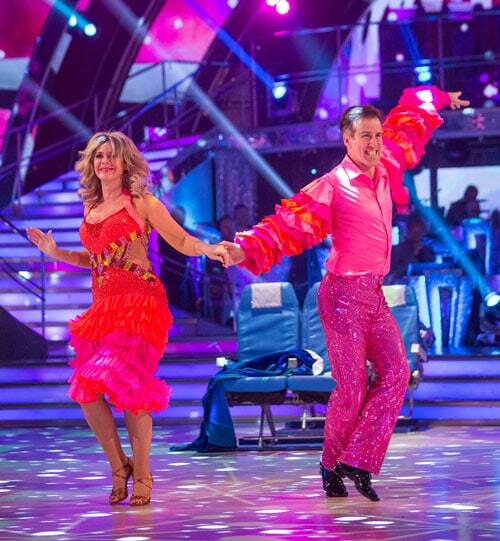 It’s the Foxtrot – my all time favourite dance – a proper dance, and we’re all set to do it justice. Tune in tomorrow at 6:45pm and watch the action unfold! As always, the weekend was upon us before we knew it, and with all the tricks and treats of Halloween Week to add to the production, it was a full-on lead-up to showtime. 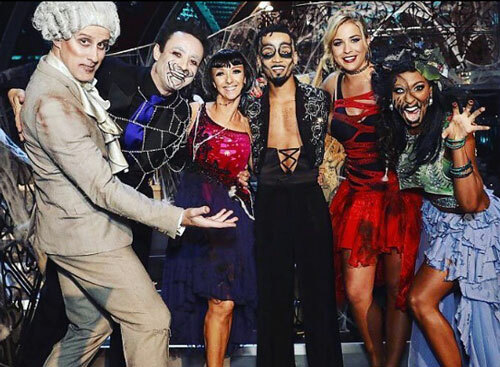 And what a show it was – the Strictly team went all-out to create what must be the most spine tingling episode ever! Whilst for our routine, our costumes weren’t as chilling or macabre as some of the other contestants’, they were just as bewitching nonetheless! To fans of the original 1960s sitcom (Ruth and myself included), they couldn’t have been more perfect – and after all, Halloween doesn’t have to be all fangs and frights! My, didn’t she look wonderful – such a spookily strong resemblance to the wonderful Elizabeth Montgomery from the original sitcom, so elegant in her glittering gown… and I cutting the charming dash of an American ad exec. with my horrifyingly 70s waistcoat! Ruth certainly got into character, as whatever magic she was channeling had us flying round the dancefloor! The quickstep is such a fabulous dance – it’s one of my favourites (Foxtrot aside), and I was so thrilled to have been able to dance it with Ruth particularly at this point in the competition where the celebs have enough technique under their belts to keep up with the delivery of a dance like this – it makes it all the more fun. I thought our dance was frightfully good! For me, Ruth nailed it – she’d certainly worked her magic on me – and on the audience too as they rose to their feet at the end of the routine! Tremendous!… We just had to hope that the judges wouldn’t be too ghoulish with their scores. Bruno began lyrically: “I was bewitched by the elegant look… slightly bothered by the frame … and bewildered: you went off on the wrong foot, but you brought it back… well done!” Ah, what a shame he’d spotted it! Craig took the week’s theme to heart and gave a truly gruesome verdict: “It lacked any style, too heavy, too sloppy… for me, the antithesis to light and bright.” Full marks for getting into the spirit of the theme, Craig! Darcey brought some light to the gloom: “It was perfectly charming – you became the character. You were light on your feet, you’ve gained such confidence. You’ve made a wonderful improvement so be proud.” That’s the ticket, and a sentiment echoed by Shirley: “You’ve made strides but you did make several mistakes. Nice free flowing, not bad with the frame, but a good effort… Besides the mistakes you’re actually improving – I feel it’s going in the right direction.” That’s what we want to hear – and such a fabulous boost for Ruth. The scores were in: a dastardly 4 from Craig, followed by three sixes, giving us a very devilish total of 22. Our second highest score so far, so by the law of averages we are indeed making some progress, and it put us in 8th place – 4th from the bottom. In Sunday’s results show, a particularly deathly chill drifted across the dancefloor when all the couples lined up to learn their fate. No need for any additional Halloween special effects either – with the dwindling number of us left, it was quite scary enough! Thankfully, this week, our names weren’t left to the very end… we were absolutely thrilled to bits to be put out of our misery and hear our names called as being saved! Hurrah! What angels you all are for voting for us and ensuring we made it through! Thank you thank you thank you!! But as always, the truly horrifying part of the weekend’s events was yet to come – the elimination. This week’s demonic dance-off was between Simon & Karen and Mollie & AJ. Sadly, despite Simon becoming something of a pro at the dance-off, Strictly’s grim reaper tapped him on the shoulder: his time had finally come as the judges were unanimous in saving Mollie. How he’ll be missed – what a true pleasure he’s been to have on the show, Simon really embodied Strictly and I so hope he’s been an inspiration to lots of viewers to give dancing a go! What a gent! No rest for the wicked, as they say… Ruth and I were straight back into training for this coming weekend’s Paso Doble. You’ll have to wait and see what capers we’ve got in store! Not long to wait though, tune in tomorrow at 6:50pm for Strictly week 7 – and with just nine couples left, your votes will count all the more! Meanwhile my loves, I’ll see you on the dancefloor tomorrow! Final call for Strictly Airlines on a flight of fancy, a journey into the unknown… and a ‘send-up’ according to Craig! But would our in-flight Samba to ‘Love Is In The Air’ earn us our wings and land us a place in next week’s show? After the thrilling success of our Tango last weekend, we were very much on a high… but as Ruth mentioned in the VT, brought straight back down to earth on the Monday morning when we had to put that dance firmly behind us and learn a whole new dance from scratch. Strictly really can be a bumpy ride for our celebrities. Ruth, I must say, is handling the weekly turbulence incredibly well indeed and going at it full throttle! …and with our fabulous in-flight-entertainment theme for our sky-high Samba, we were lucky enough to visit a British Airways training centre where Ruth was given some top tips on sliver service and smooth trolley action from the pros! Then, all of a sudden, we were airborne. Cruising at 30,000 feet, I was reading my newspaper when the opening refrain of ‘Love Is In The Air’ drifted down the aisle with Ruth, her trolley and her Farrah Fawcett hair, and I knew this was no ordinary in-flight service. First Class indeed! Our eyes met, seat belt off, we circled the drinks trolley, and then the flight was ours and we took it to an altogether new destination! Garbed in a fetching 1970s cabin crew uniform, and I in a trademark suit and tie, perhaps it was the altitude, or perhaps it was the sheer joy of the moment… we felt compelled to whip them off to reveal outfits we’d clearly been saving for a carnival at Copacabana Beach. What a sight we must have been to behold! And how I managed to keep my sleeves tucked inside my jacket I’ve yet to fathom. Those sleeves – there was so much movement going on at times it felt like a group dance! Apparently they mesmerised the viewing audience, according to the Radio Times. They were the perfect match to Ruth’s dress, it’s truly a wonder we could concentrate with all the frills going on! A truly exuberant performance. You could see the glee in our faces as we travelled around the dance floor like the life and soul of the party. Reverse rolls, hip action, horse & cart, we had it all! I thought Ruth absolutely captured the spirit of the dance and gave a tremendous performance – she really is my high flyer! Craig began with “Well… I thought I was at the Pan Pacific Grand Prix with Doug and Shirley from Strictly Ballroom back in 1950. I’m unsure how to judge it as it was a ‘send-up’ – I know it had samba in it…” A ‘send-up’? I wasn’t going to let that slip by, so I chipped in “It wasn’t a glancing nod to a samba, it was the real McCoy!” The audience erupted, then Craig continued… “I loved it for its comedy and its showbiz, but not its technique.” We’ll take the first two and you can keep the last! Send-up? Good lord! Then Darcey: “Slightly over the top but you came alive on that dancefloor. This crazy side – you were having fun, you were energized… Fabulous!” Marvellous – Darcey can come to our party next time! Shirley had got the measure of the dance: “Brilliant concept – definitely a parody from 1976. Difficult reverse rolls but Ruth kept up. There was Samba content and I thought the concept was fantastic.” Hurrah… always good to impress the head judge! The scores, well, I’d have personally marked higher for flamboyance and costumery (wouldn’t you?! ), but alas, some things don’t seem to change… Fives from Craig and Darcey, and a welcome six from Shirley for a total 16. For the first time in 15 series I’m disappointed Bruno wasn’t there – we could’ve done with an extra 4! Due to his absence from the judging panel this week, the scores were out of a total 30… and it caused a bit of a jam on both halves of the leaderboard with four couples tied at 24 and four couples tied at 16. That of course included us, and I can only presume for alphabetical reasons, Ruth and I found ourselves at the very bottom once again. Oh dear. That was a crash landing for our routine, that’s for sure. Would your votes be the life preservers we needed? Doors to manual… was this our exit? The Results show was a tense affair. Well, I say that, it’s always a tense affair but more so this week as we were left til last before finding out that we were saved. My goodness me, those few seconds felt like an eternity waiting for names to be called. It never gets any easier. Thank you thank you thank you! We’re both on cloud nine to have made it through to next week – and it’s not just any ol’ week, it’s Halloween week!! But of course, there was a dreaded dance-off, and this week it was between Simon & Karen and Brian & Amy. Both such wonderfully entertaining couples and they both performed with such confidence and enthusiasm the second time. Rules, however are rules, and judges are the judges. Both Craig and Darcey chose to save Simon and so Brian & Amy were out of the competition. What a sad loss for the programme – Brian’s wit was a true asset to the show, as well as to all the celebrities’ camaraderie and morale too. Let’s all hope he keeps dancing! For this coming weekend, we’ve the fabulous Quickstep, and it’s to the theme of Bewitched – there should be plenty of tricks and treats in store for Saturday night (not least from the hair, makeup and costume departments!). Whilst I’m on the topic of treats… here’s another one for you! I’ve this week announced the release date of my debut album! (Haven’t I been a busy boy!) I’m very very excited indeed about it – it’s called ‘From The Top‘ and it’s a wonderful collaborative album of 17 tremendous tracks – such fabulous tunes, I can’t wait until the 24th November when it’s properly released. In the meantime, you can find out more about it here on my blog, and pre-orders are being taken so you can reserve yours and receive it as soon as it’s available! There’s also a competition to win a lesson with me, too! See the blog post for more details on that. Don’t forget, you can follow all my news – about Strictly and my new Album – on Facebook and Twitter too!